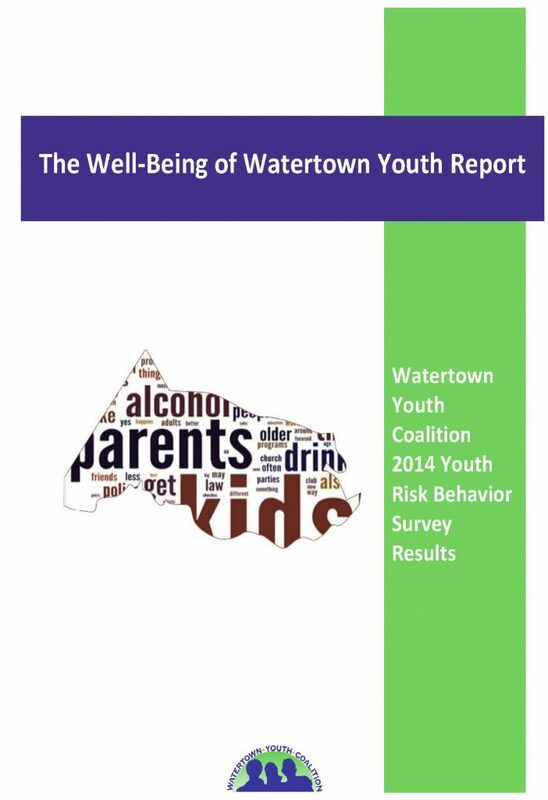 The Well-Being of Watertown Youth Report summarizes key findings from the Youth Risk Behavior Survey (YRBS) results. The YRBS is administered to Watertown High School and Middle School students every 1-3 years, and the results are used to identify and track the prevalence of health-risk behaviors engaged in by Watertown adolescents. Survey procedures are designed to protect the privacy of students by allowing anonymous and voluntary participation. Created by the Centers for Disease Control and Prevention (CDC), the YRBS asks a series of questions about a range of behaviors including Alcohol Use, Marijuana Use, Other Illicit Drug Use, Tobacco Use, Weight and Weight Control, Bullying, Depression and Suicide, Sexual Behaviors and Protective Factors. The Watertown Youth Coalition (WYC) partners with Watertown High School and Watertown Middle School to help administer the survey, which is conducted during the spring semester of each year it is given. In addition, WYC produces these reports, based on survey results, which are available below.